Cut calories and fat from indulgent doughnut holes and creamy Buffalo chicken dip with easy ingredient swaps from Joy Bauer. As a snack lover, I was thrilled to tackle two indulgent challenges: Buffalo chicken dip and cinnamon-sugar doughnuts. After lots of experimenting (and taste-testing) in the Bauer kitchen, I managed to come up with two slimmed-down versions that are shockingly decadent and totally delicious! This creamy dish tastes like a big bowl of Buffalo wings dipped in blue cheese. I snuck in some cauliflower and Greek yogurt to bump up the nutrition factor and volume, but I promise nobody will notice. Sports fans, this makes a perfect game day snack. 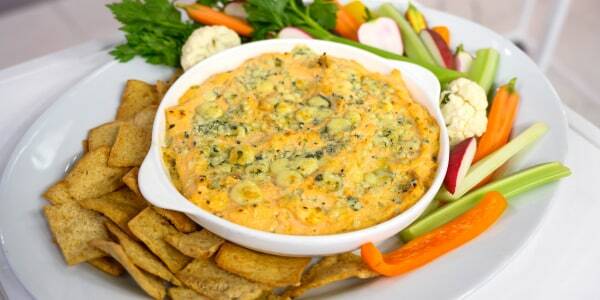 Grab your carrots and celery sticks and get dipping! My taste testers flipped for these mouthwatering doughnut holes! Each one is packed with lots of sweet cinnamon-y goodness and only clocks in at an amazing 40 calories a pop. And did I mention the recipe is ridiculously simple? For more delicious recipes, follow Joy on Twitter, Facebook and Instagram and check out her cookbook "From Junk Food to Joy Food."